Safety is incredibly important at GoFleet, whether in relation to drivers themselves or maintaining the integrity and safety of client data. All Geotab services and products – both old and new – are constantly held to this paradigm. Below, we will dive further into engine immobilization and describe how the NFC Tag Reader and the Driver ID Relay can be used to help manage the on-road safety of fleet drivers. Because of the high variety and assortment of vehicle electronics and electrical circuits, it’s apparent that it can be challenging to wire the relay in a way that is fail-safe for immobilization. In a situation where an individual is not a licensed automotive electrician or equivalent, the complexity of the installation can lead to a vehicle not being able to start if for example the relay or a part of the circuit fails. No one wants to be responsible for causing a vehicle to fail to start when someone really needs to get home. To ensure a quality install, we recommend professional installation by a knowledgeable technician. The combination of the Driver ID system with the GO device is designed to ensure that the driver identifies themselves before they begin to drive. Adding a relay to the Driver system can activate a switch or turn a third party device on or off. It can even be used to activate a third party drive inhibitor or rev limiter that is both effective and safe. Geotab and its providers can’t always guarantee that a vehicle can be immobilized 100% reliably. For example, it will not work if there is no cell network coverage. The included relay can be used as part of the immobilization solution, but Geotab’s support ends at the functioning of the GO device and the relay. A licensed automotive mechanic/electrician would need to select an appropriate inhibitor for installation. There is a different standard applied to systems that can affect safety versus systems that can’t and it is important customers understand this point. This is the reason the relay should not be wired-in directly for immobilization. The wiring diagrams for every possible vehicle make, model, and year are simply not available or practical to obtain and each has different potential issues. We’ll continue to support both the NFC Tag Reader and Driver ID Relay, individually and in combination with one another. The Near Field Communication (NFC) Tag Reader is an extremely popular add-on for GO devices which is used for driver identification. Through the use of the NFC Tag Reader, we offer a simple method for identifying and tracking drivers in pooled vehicles. With a simple touch of the NFC fob, vehicle operators can easily, quickly, and securely transfer their driver identification information up to the cloud. Driver IDs are tracked using driver tags/GO keys, which use the same NFC technology. Each individual driver tag has a unique serial number and can be paired with a particular driver, linking individual trips to drivers. A GO device can be configured to beep constantly until a key fob is tapped to remind the driver to identify themselves. To learn more about our NFC Driver ID, take a look at Geotab’s NFC Driver ID Innovation History. 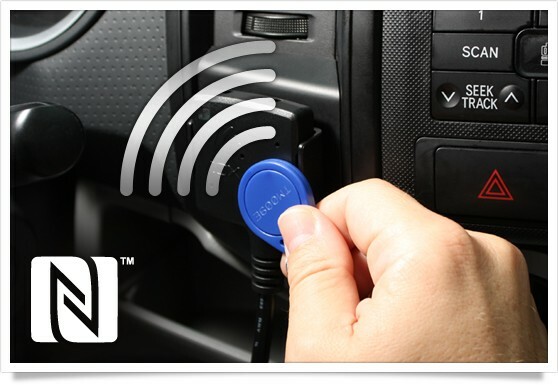 The Driver ID Relay can be used in conjunction with the NFC Tag Reader. This product requires professional installation by a licensed automotive electrician/mechanic. A relay is an electromagnetic switch that uses a small electric current to control the flow (i.e. turn off/on) of a much larger electric current. Our products for the IOX can be daisy-chained together with up to four components. Think of a power extension plugged into another power extension, plugged into another, etc. Using the NFC Tag Reader and Relay in conjunction allows access to certain key features of a vehicle, making it a powerful tool for accountability and safety. In the case of daisy-chaining, the NFC Tag Reader has to be the first in the array. Since the Relay can essentially prevent current flow, eg. act as an open circuit until a key fob is tapped, access can be prevented to various components of a vehicle. If installed correctly, access to a light, switch, PTO, or other input can be restricted. For more details on the installation requirements of the Driver ID relay kit, check out the SPR-RELAYKIT Installation Document. Contact us to learn more about our other products and solutions.